I'm still knitting on my Einstein Coat. It is a LOT of knitting. 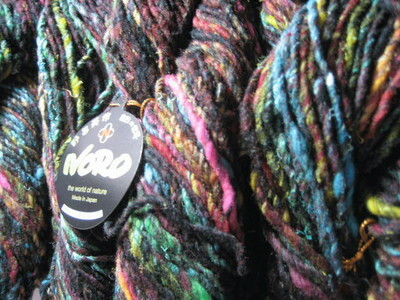 I think I've mentioned before, oh, say maybe three hundred times, that I'm in love with Noro, so that's okay. 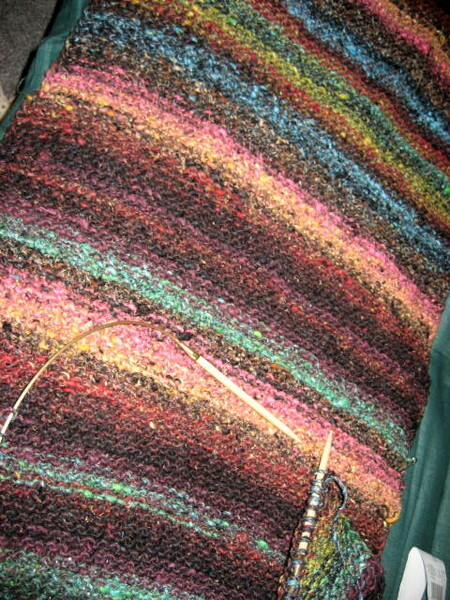 Pictured above is the bottom portion of the coat. The camera is not doing any justice to Einstein at the moment. I've been recently diagnosed with Grave's Disease which is a ghastly way of saying that I have hyperthyroidism that's caused by an antibody in my system that makes my thyroid produce too much thyroid hormone. I went into the doctor's office because I was having heart palpitations. Of course, I assumed I was having the "big one" so instead of immediately going to the hospital, I resolved to die quietly in the comfort of my own home. After a few days, I never died, so I figured I should go to the doctor anyway. The funny thing is, there are so many symptoms to Grave's Disease that are non-specific, such as: restlessness, fidgeting, nervousness, excess hair shedding, itchy skin, tremors, eye soreness, mood swings, depression, fatigue, weight loss, shortness of breath and irritable bowel. I had all of these symptoms, but I thought that I was just getting old, fast. I'm starting to feel better now, with the help of medication. If you are suspect of your thyroid, I urge you to get checked out. Thyroid problems are pretty easy to treat these days (or at least that's what they're telling me). Another thing jumped on my needles! It's Koolhaas. I know, just like everyone else in the knitting blogosphere. But, it is so irresistable! I think Jared (the designer) is some sort of knitting genius or something. Look at the picture on the link to his website and you'll see what I mean. It's a lovely trellis pattern. You will want to make one, too. Last night I went to class for the Einstein Coat. I hope mine turns out this well. My mom treated me to the class and it was a hoot! We met some great ladies (Raveler's too) and one "soon to become Raveler". yay! I mentioned before, that I'm using Noro for my coat, but I couldn't resist this shot of the Noro just sitting there vogue-ing. Hopefully I won't try to to take on any more projects until one of these babies is done. 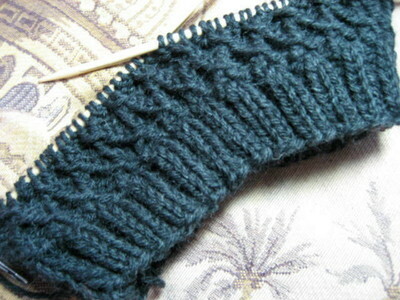 I think I have about five on the needles as I write. Must.get.my.priorities.straight!! Have fun watching the superbowl tomorrow! that I've got a sweater on the needles. 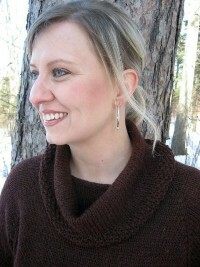 It's Mariah from Knitty winter 04. I've admired this one since I first saw it, but never really had the guts to do it. The sleeves are the only complex portion. I had to use size 5 needles instead of 7's. 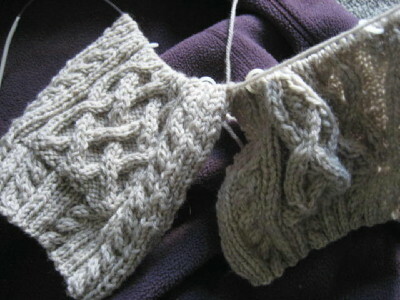 I forgot that I could do two sleeves at the same time, so I'm catching up with the second one. I feel the need to apologize for my rant about Maggie vs. the couch. It was however, therapeutic. I don't have the heart to put a muzzle on her, so I am participating in destructive dog behavior therapy. Which includes- not reacting when she destroys something-which is oh so difficult. Offering her numerous toys in her kennel during the day so she doesn't sleep ALL day. Apparently, when you react to something they've destroyed they just think it's "attention". I must elaborate..Maggie came from a place where she had NO attention. When I rescued her, I pretty much spoiled the crap out of her and contributed to her separation anxiety. Or something like that. Enough canine psychology. In bellydancing news, my sister and I are going to the Northern Lights Bellydance Festival at the end of October. My friend Shannon (sadly blogless) Hi Shannon! who is also a knitter and bellydancer is considering going too. It sounds like a hoot!! 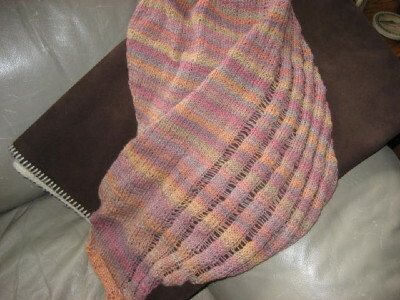 Everyone in the blogosphere has already knit clapotis. Me? this will be my fourth. Only this time it's with sock yarn on number four needles. A nice lightweight smaller "Springy" version. A girlfriend of mine knit one like this on her first attempt. It turned out fantabulously!!! I'm sure this one will, too! AND....I'm not allergic to this yarn. I'm using Trekking XXL, sock yarn. I have no complaints. Other than that....it won't be socks, but we won't be really needing those too much in the upcoming months.